Then you have to try this recipe! But the DreadBrewer made this for me once and it quickly became one of my favorite quick-and-easy recipes. Try it once; you’ll like it, I promise! First, mix up your tuna salad. ((I don’t know why all my pictures look green. Stupid iPod…)) This is only half the recipe as it occurred to me to put this on the blog after I had already started. Put 1/4 of the tuna salad on one end of each rectangle. 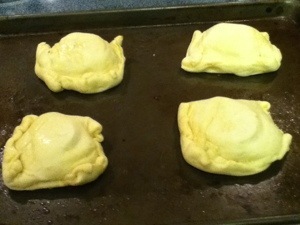 I always flip them over halfway through baking to get them crispy on both sides. They’re warm and gooey and absolutely delicious. DB and I eat 2 each, but a more reasonable person could probably be okay with one and some veg. Seriously, though – give them a try and let me know what you think!!!! 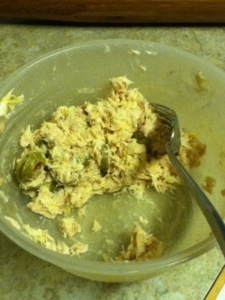 This entry was posted in Home Life and tagged Easy, Recipes, Toddler Approved, Tuna Salad by BrewsterMama. Bookmark the permalink.